How secured is your WordPress blog? Have you ever given some thought? If No, you should start thinking about the security of your WordPress blog, now on. Merely setting a strong alpha-numeric password with special characters and thinking ‘ I am safe now ’ is definitely a false sense of security. And, may cost you very heavily in the future. Security threats are too vast, ranges from a poorly coded plugin and theme to your WHOIS information and browser. One thing is clear, your WordPress blog security is not an One-time-deal. Security is like a Lifetime commitment, just like a relation between Mother-and-Daughter! A number of good quality WordPress security plugins are available, which can protect your blog from hackers. I am listing 11 best plugins for you to use on your WordPress blog. Security Routine: You should invest at least 30 minutes, every week or fortnightly for scanning and different security measures. 1. Bullet Proof Security: This plugin secures important files and protects against attacks including XSS, RFI, CRLF, CSRF, Base64, Code Injection and SQL Injection. One of the best security plugin. 2.WP Security Scan: It scans your WordPress blog for security threats and suggests corrective measures like – Passwords, File permissions, Database security, Version hiding, WordPress admin protection/security. Definitely, a complete WordPress Security Plugin. 4. Ultimate Security Checker: It identify any security problem with your WordPress Installation. After complete scanning, it awards a security grade, based on how secured your WordPress blog is. 5. WP-DB-Backup: Regular (weekly or fortnightly) backing up your WordPress blog is a must from security point of view. It helps restoring your WordPress blog, once it is hacked. This WordPress plugin allows you to back up your core WordPress database. 6. Chap Secure Login: It secures your Pass Word, during login, on an insecure channel. Use a SHA-256 hash algorithm. An useful security plugin. 7. Restricted Site Access: It prevents visitors, who are logged in or accessing the blog from specific IP Address. It offers multiple options for handling blocked visitors. 8. Login Lock: It enforces you for a strong password policies. It also blocks hacker IP Addresses, monitors login attempts with an emergency lockdown feature. 9. Limit Login Attempts: It limits rate of login attempts, including by way of cookies, for each IP addresses. 10. One Time Password: This WordPress security plugin protects your blog in less trustworthy places like cyber cafes. 11. Akismet: The ultimate spam fighter. When you label a queued comment on your dashboard as spam, Akismet block it’s origin forever. Its like contribution/fighting by the whole WordPress community against spam. Bad habit: Sometimes, instead of labeling a comment as spam, bloggers edit them and approve them as un-spam, knowingly, to show comments on blog posts. This way, you are promoting spam, nullifying the whole purpose of Akismet. WordPress security is a never ending topic. We have discussed just the Plugins part. I will write a comprehensive article about WordPress Security in the coming days. Apart from these 11 best WordPress security plugins, suggest your best pick in the comment section. There are many dealers out there from which you can be buying your Recharge PINS of ALL networks. You are going to be dealing with these major dealers and NOT DIRECTLY with MTN, GLO, ZAIN etc UNLESS you too want to be a MAJOR DEALER. Before going further, I hope you have read the articles below, if not kindly read them before you continue with this article. For those who are ready to go into the Recharge Voucher printing business and start making extra income with a start-up capital as low as N10, 000 or more, I have taken my time to compile a bumper package which will get you on the successful track instantly. 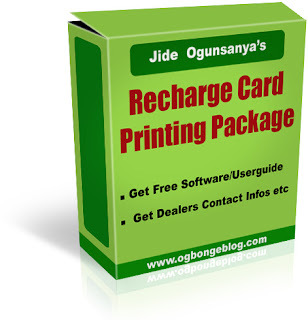 ** A FREE SOFTWARE that you can use to start printing recharge Vouchers of all networks, though you still have to order for PINS. ** A simple to understand USER GUIDE with pictures on how to start printing recharge vouchers. ** Complete Infos of the Major Dealers In Nigeria from where you can be buying recharge PINs you will be printing on papers. ** Great Marketing ideas to help you succeed with this hot, lucrative business. This is the most challenging aspect of voucher business because, it is not the number of recharge vouchers that you can print in a day that matters but the number of vouchers you can sell on a daily basis. 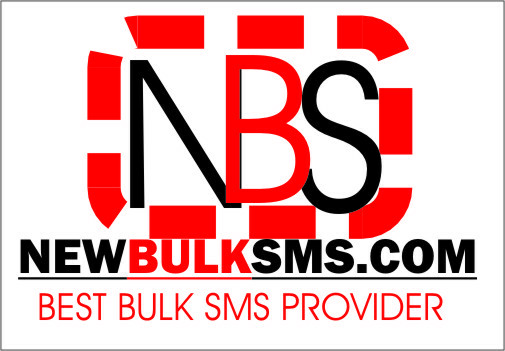 ** The names of the dealers or companies you can choose from, their contact addresses, phone numbers and websites addresses of those that have websites(Not all these dealers have websites). ** The range of prices the different dealers are selling recharging PINS of all the different networks. ** The contact addresses of the dealers that require you to have access to computer and those that do not. ** How you can still patronize dealers that will require you to have access to computer without you needing to buy your own computer and subscribe for personal internet. ** How you can make your business name and address appear on each recharge voucher you print. ** How you can reprint a faded, skipped or any lost voucher during or after printing…..and MANY MORE. By the time you digest the package and start the business, you will find out that within some weeks, you will be profitable and smiling to the bank. Besides, it is a skill that stays with you for the rest of your life. 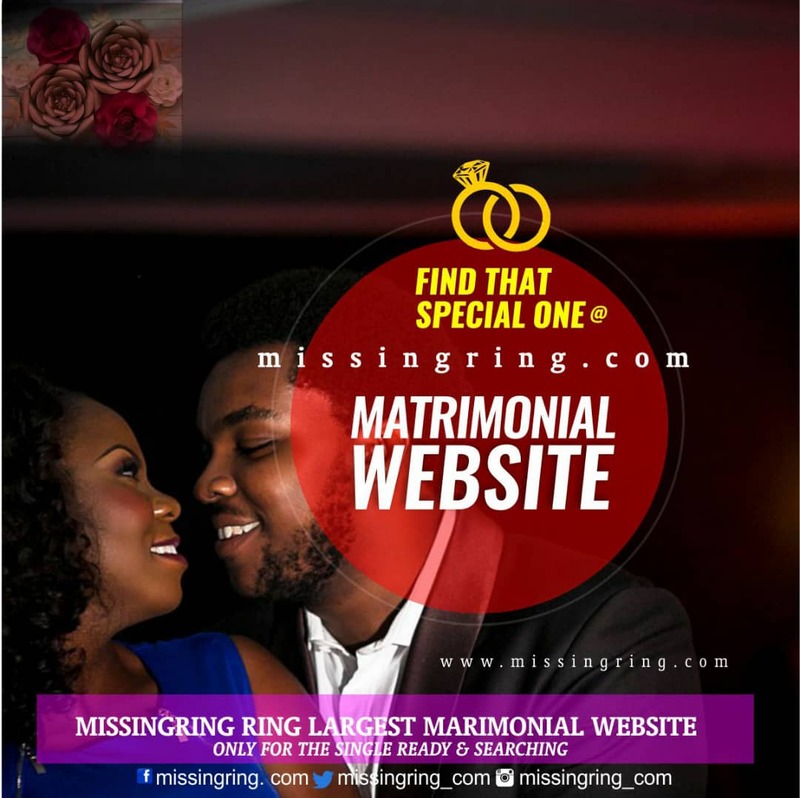 The package is like giving you the map to a goldmine and if you try as much as possible to get the package, am sure you will forever be grateful for the opportunity to discover the goldmine. The package is NOT FREE OF CHARGE. The package worth N5, 000 considering the fact that it is like giving you the secrets of printing money forever but I want to prove to you that I am not greedy but just want to help considering the current harsh economic situation of the country . So instead of selling at N5, 000 like my friends advised me to, which is still a good bargain considering thousands of Naira people keep paying at SEMINARS, I have decided to sell it low at N1, 000 to the first 100 serious Nigerians that order for the package. 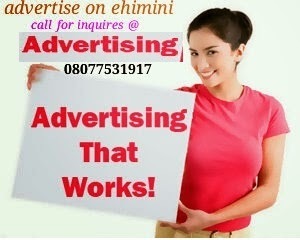 After selling to the serious 100 Nigerians, I will then increase the selling price of the package to N2, 500. Now, that means there will be a rush for the package. With thousands of people coming from different search engines, forums, blogs etc; to read this free article in its first week of publication, I am sure all 100 spaces will get filled up within two weeks. SO HURRY NOW AND MAKE YOUR ORDER. If banks could be interested in having a share of this lucrative business, SO WHAT ARE YOU WAITING FOR? 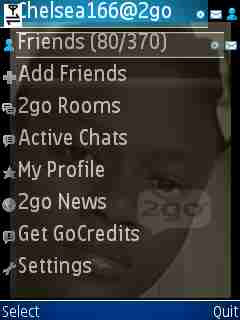 To order, you have to pay N1000 to any of the accounts listed here . After payment, you will have to send a text message to 07062918898 about your payment details and your email address where the package will be sent to. Once your payment is confirmed, you will get your package asap,delivered right into your inbox. CAN'T MAKE IT TO THE BANK OR NOT CHANCED TO GO TO THE BANK, text me and I will tell you the alternative way you can get the payment across to me.. The first 100 Nigerians to place their order for the package will get a full resale right to sell the package which means they will get the rights to sell the package and keep the money to themselves 100%. That means if you buy the package for N1, 000 and sell it at the same price, you only need 500 sales and you would have made N500, 000. How easy it is to make money in Nigeria from Information Marketing. No matter how worsen the economic crisis might be, people will continue to buy phones, buy recharge vouchers and make calls, so what are you waiting for to tap into this hot business. As a blogger we know that how important it is to promote our posts to social networking sites, because now Google is also considering social traffic in search engine ranking. If your post is widely shared among social sites and has got numerous likes and share, then it is a positive signal to Google to rank your post high in search engine. 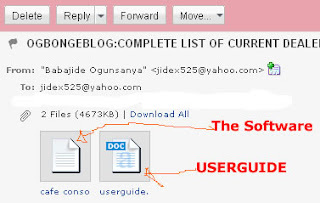 If your blog has high followers on different social sites and you are not able to share your posts to your followers (we know how tight your schedule is) and due to constrains of time, it could be tough and not possible to share your content with your follower, then you need not to worry anymore because today I am going to share how you can share your posts to Facebook And Twitter automatically. Previously I have shared how you can post automatically to Facebook only but today in this tutorial you will be able to share to Facebook, Twitter as well as LinkedIn automatically. This is possible from a best website called Tweetfeed where you have to only create and link your page and after that your posts will be automatically shared to Facebook And Twitter with the help of rss feed of your blog. 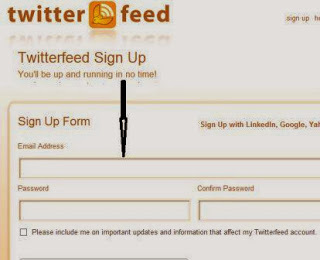 Firstly go to Tweetfeed and sign up by entering basic information like email, name etc. 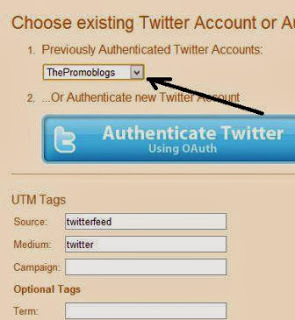 After sign uo go to homepage and add your blog name and enter your blog feed url.Make sure that your feed url is correct.Click next. Choose account where you want to automatically share your posts.In my case I have selected twitter page. 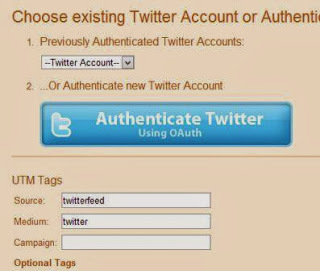 Click on authenticate twitter which will lead you to twiiter sign in page. After that a successful message will be shown.Click on done. 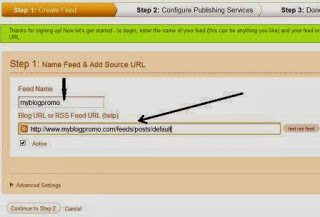 After this your post will be automatically shared to your account whenever you posts new content on your blog. Similarly you can easily configure for Facebook. You can set either title or title and description both to share on twitter and Faceook.And best part is that you can set checking frequency.For example I have set 30min checking frequency ,by which it will ckeck automatically every 30min for your new posts. Robot.txt file is simply a line of codes that tells crawler what part of site to index and which not. As a blogger you should at least know the basic of Robot.txt file. Although it sounds more technical word but it is just as simple as publishing post. In this tutorial I will be sharing about tools that will help you to easily create Robot.txt file and tools to check whether the file you created is right or not. Because just a line of wrong code can block your site from being index in Google which ultimately leads to no traffic. You don't need to go into the technical aspects and meaning of each line and neither I am going to teach you, but I will be sharing simple meaning and a tool that makes it easy to handle all. For example there are many parts of blog like archive, labels, search pages which we usually don't like to display in search results. All these pages contains duplicate content in perspective of a crawler which in returns cause duplicate content issue and finally lower ranking. You will get the notification for the same in webmasters tool. To fix that I already shared the ways previously. So by simply blocking all these type of pages in Robot.txt file you will save all these kind of issues. 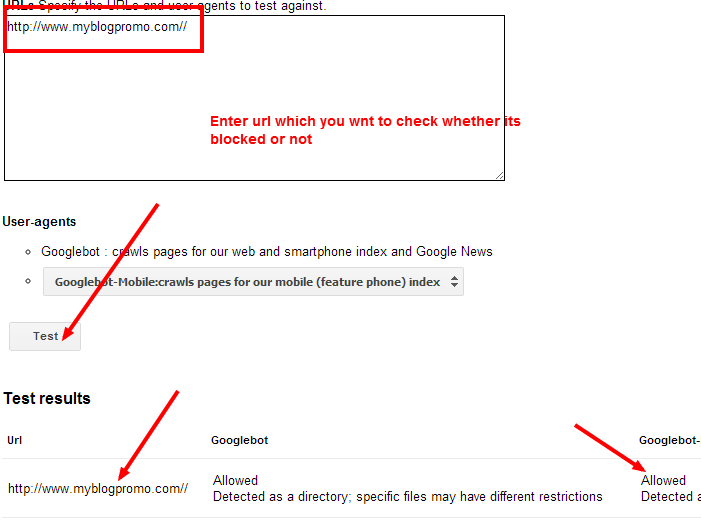 Similarly on WordPress you can block wp-admin area from robots and similarly other directories. Having a Robot.txt file gives you advantage of a better blog management in terms of seo and Google crawler love that too. There are no disadvantages as such but wrong use of Robot.txt file could lead to serious problem in blog. For example you could accidentally place a code that actually tells crawler to not index you blog. Similarly you might end up yourself blocking important pages. When I was newbie I also blocked my sitemap from Google crawler and that caused the problem of not indexing my further posts. But I figured out in webmasters tool and immediately fixed the problem. But you don't need to worry if you make use of tools that I listed below. But using these tools you can check whether you have correctly placed the code or not. These tools are simple to use and it makes all hectic of understanding Robot.txt file easiest. You just need to add the URL which you want to block and just hit enters. This tools will automatically add it to you file. After you complete just copy the code and paste it into your Robot.txt file. Finally use tools to check the correctness. In blogger you can easily add Robot.txt code by going to settings>Search preferences. I strongly recommend you to use these tools after you added the code to your blog, because if something went wrong you would not be able to recognize the problem. Just copy the code from your blogger Robot.txt file and paste it in the box provided. Now in the lower box enter your URL which you want to check and click test. You will see a message showing the status if the URL is blocked by Robot.txt or not. It also shows the line which is allowing or blocking. 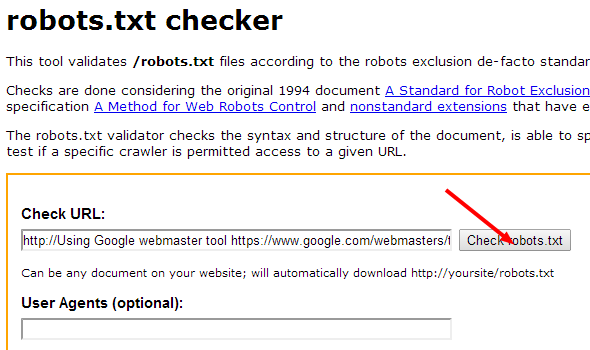 Remember adding code here in webmasters tool is just for testing purposes, it doesn't add Robot.txt file to you blog. 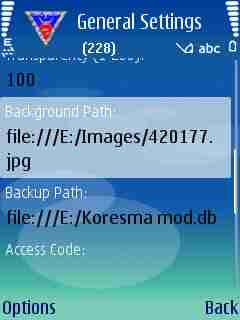 For that you have to add the file in you blog only. 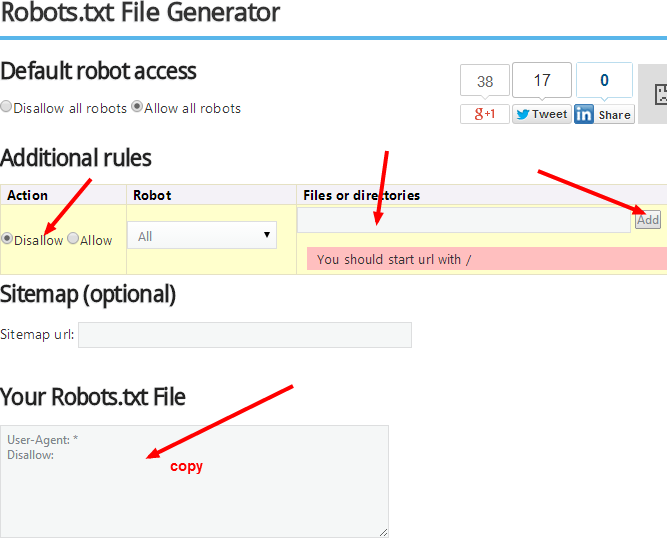 This was the simplest yet effective tutorial to understand and implementation of Robot.txt file in your blog. All the probloggers use Robot.txt for their blogs and you should too, but make sure you don't end up your blog harming firm it. That's why I have shared the testing tools as well. Do you have any questions? Did you placed wrong code in your Robot.txt file? Do you want to know what's the meaning of each line is? Please feel free to ask me in the comments below. I am always here to help you. Also share you experience of using Robot.txt file. Don't forget to like us in Facebook and Google plus. I have seen many newbie bloggers saying that they are not getting enough traffic although they are publishing so many articles. Why is so? Here comes the point which they are missing, the blog promotion, which is as much as important and must as creating content. For that there are many different ways to get your blog spread over blogosphere which every problogger talks about and Apart from the usual ways to promote your blog I had also shared some ways to get your blog promoted by unusual ways. 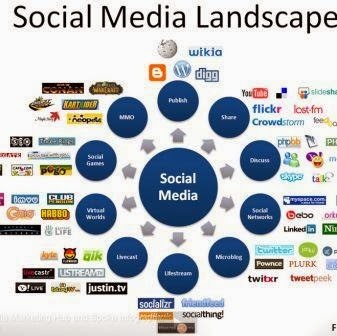 On the top list we talk about social media website like Facebook, Twitter and Google plus for promoting out blog content and that's also award us with some descent traffic only if we have a large fan base and that too targeted. And the second number that comes at the top list is blogging community. Blogging community not only gives you the targeted traffic but it makes a little different from social media websites. Blogging community gives you great oppuritinuty to make connection with likeminded people, learning from fellow bloggers, asking for help and building high readership. Blogging communities can benefit you in number of ways including commenting, asking questions in forums, promoting your articles, participating in conversation, appreciating others content and much more but in this list I am going to share only those blogging community which are top on the list and offers features which most of blogging communities doesn't provide. Here I am sharing some features which are unique about these communities. All the blogging community which are listed are high authority and high page rank and best part is they provide dofollow backlinks which is all we wants. Because Google will index your submitted link and passes the page rank juice to your blog which not only increases your page rank but also increase your search engine ranking. With this blogging community you will be getting yourself into the ocean of people who thinks like you and there are almost all from problogger to beginner. You can ask problogger to help you or ask them to accept you to post guest post on their blog and also helps beginner who might get caught in simple perspective by mean of which you will be creating a community around you which not only helps you to increase your blog exposes but also a backup.Thus building relationship with blogger is one advantage of using blogging community. Although all blogging community offers same feature but some of these gives unique features as well. Not going into depth of features really and benefits I would come directly to the list of best blogging community which you should consider using. I would recommend you to at least use 3 blogging communities if you really wants to get something out of it. Blogengage is number one blogging community which almost every problogger uses. I have made a separate review of blogengage in which I have deeply shared its stunning features. Although it's premium blogging community but the spending one time money is really worth. I am a member of blogengage and the results we are getting are awesome. I would really recommend you to use and have a look at this platform. This is another blogging community which I am using and Apart from giving dofollow backlinks, I really liked its simple feature and the way it works. 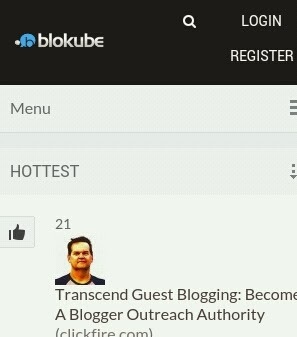 Number of bloggers uses blokube and there are many features which really works when it comes to promote your blog. Unlike Blogengage, blokube is free to use and the registration process is really simple. Based upon the number of votes your ranking depends and if you create stunning and high quality content, you content get to position one. Bizsugar is another blogging community which is mostly used by bloggers to promote their posts. 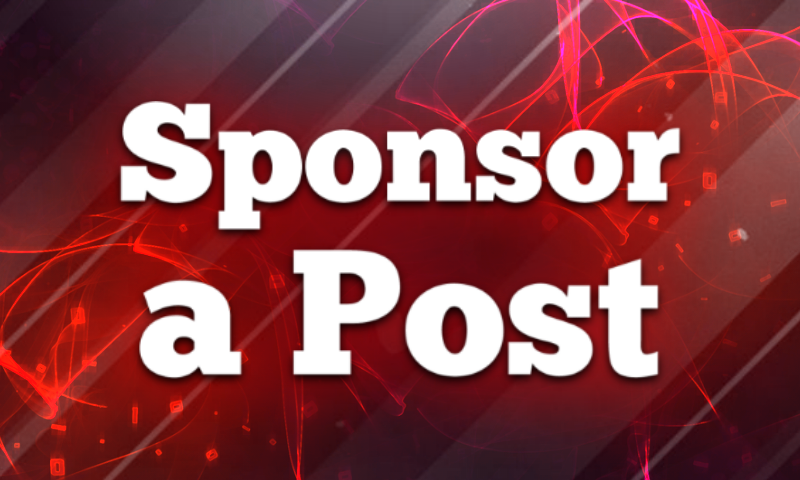 When you sign up initially, you would need to go through sign up moderation process while submitting your first article, but after it approves you are free to submit and share infinite posts. This community is best if you want traffic to your blog because being huge number of users you would be getting enormous traffic. 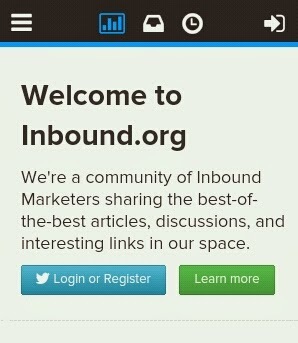 Inbound is another great one in the list which has large number of active users. If you get high votes for your submitted article, you would easily get it to the home page and get features which in return reward to you with precious traffic to your blog. Participating in forum discussion, voting for others etc are few things which you would love to use and build connections around you. Klinkk is another awesome community you would love to join as it has been continuously spreading and becoming popular among bloggers. Although it is quite same as the blogging community above but you can give it a try and add it to your list. 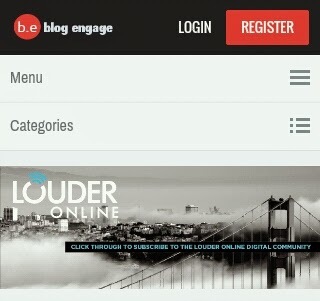 Strictly for Indian bloggers, indiblogger is one of the top and best blogging communities which I strongly recommend. 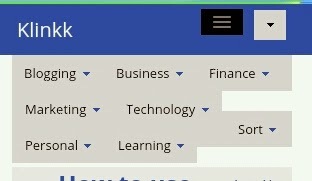 Similarly operated like other community, it does have some unique features which it makes different from others. Although it is free to join for everyone, but before submitting your first time post there, it need to pass through manual submission from administration. 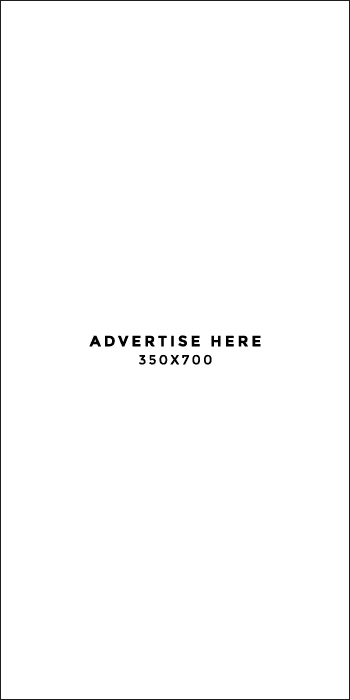 And after that you can only post the links from URL, for which you have been approved. Indiblogger is quite helpful to make friends and look for another blogger around your cities. Another great thing is their indirank, which is a ranking system to make a list of top blogs in India. Category wise they have a list of top bloggers and you can start following them right after the registration. One great thing to mention is bloggers meet which they conduct quite often where all blogger from India get together and show their knowledge. Problogger as well newbie bloggers participate in these bloggers meet, which I found interesting day unique. They also have others lovely features which you would love. 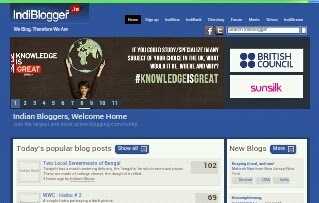 So if are blogger based in India, then I would strongly recommend you to use indiblogger. So if you are one of blogger struggling to get traffic toyour blog, then go ahead and do some homework in blogging community, I bet you would get results straight from the day you enters in. But make sure to not get involved in spammers activities around, otherwise it will only harm you. Try to make connection in positive manners as its only thing which matters lot in blogging. Please do share with us which of these communities you are looking forward to join and why? And also feel free to share your experience in past if any with any of these community? Although I have put my best to make the best list but if I forgot to mention any other top community which you think should have been added to this list, please share within the comments below. Don't forget to share with your friends on google plus if you liked the post. This is a complete list of all internet data bundle plans provided by all Nigerian Internet Service providers with their prices and subscription/activation codes inclusive. It comes in handy if you do not know which network to choose from and which Internet bundle plan you would love to activate for your usage. 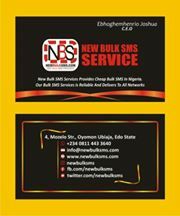 This guides covers the various major network providers in Nigeria namely; MTN, Airtel, Glo and Etisalat. Let’s start with MTN. Hello friends, have you guys started to flex the new Airtel package as I posted about its release recently? That is all. Hope it helps. would do more harm than good as many people won’t be able to copy various codes I’ve given out here. 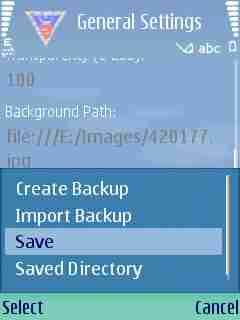 So use this function wisely. Add it to your site’s CSS file and save. Right click would be disabled in the selected region. The internet has really proven to be a place for great money making opportunities in recent times and is the major reason why everyone wants to build a website for their business. Considering the fact that all businesses are going online, web-designers are really sort after for their services. If you started a small webdesign business recently and looking for ways to promote your web design business to get more clients and make more money, here are 6 must know tips for your business promotion. If you intend providing web design services for clients, you surely know how important it is for you to have your portfolio website. A portfolio is were you show off the best jobs and designs you’ve done previously. One thing to bear in mind is that you should have your best jobs out there in your portfolio, and at least 5 screenshots of 5 jobs you’ve done. Your portfolio has it’s way of convincing clients to do a job with you. If you want to make a head way in this industry, you have to make sacrifices at the start. I’m not trying to encourage you doing free jobs, but you should start with a couple of free or cheap jobs so as to get referral clients. Those clients you did free jobs for would definitely let others know about your services and get you more jobs. Considering the fact that you need a couple of websites in your portfolio, starting up with free designs would get you websites for your portfolio. On every website you design, make it a habit to link back to your portfolio website. For instance, placing a link from the clients website footer with an anchor text such as “Designed by [Your Company]” . This has proven to be an effective way to get referral clients especially if your design is great. Advertising on social media sites such as Facebook. Make use of Google Adwords to advertise on Google search results. Advertising on blogs that are related to the Web Design niche as you’ll be able to get new clients from this. Advertise your webdesign business Offline with mediums such as the TV Stations, Radio,Newspapers and wherever you find yourself. Search engine traffic is one free traffic source that usually turns out to build a huge client base for firms when SEO (Search Engine Optimization) is done properly. You can learn the basics of Off and On Page SEO, it’ll help you rank your portfolio website for terms such as “Webdesign Services” and more related terms. Blogging is another method to attract your target audience and clients to your website (business website). I remember I wrote an article sometime about how important a business needs to start a blog. You can read more from the link below. Having read through this blog post, the best thing you need do is start implementing the tips outlined here and start making more money designing websites. Feel free to leave your questions and contributions using the comment box below. We had actually written a post where we listed out all spectranet data plans, but today when I was about renewing my data using Quickteller, it was unsuccessful and therefore made me take a stroll to one of their offices here in Abuja. On getting to the place, I was welcomed with a new price plan list and guess what, the new spectranet plans are really cheap compared to their former plans and other service providers in Nigeria. The night plans are quite affordable and great for people who are willing to sacrifice their nights for cheap internet surfing. NOTE: The Spectranet LTE Nite Plans work 24×7 during weekends and other public holidays. These are basic plans you might want to consider for your personal use. They work 24×7 all through the month. I guess this would serve mini firms who make use of the internet. There can be situations where you use up your data plan before the validity period comes to an end, never worry as spectranet makes it easy to top up your data bundle for N1000 only. These are the best data bundle plans around as compared to our major telecom networks in Nigeria. I really enjoyed my day out at their office. Tweak, risk and luck is involved.